Villas Rana Verde in Sayulita, where in addition to being available for rent separately, you can combine any of our incredible vacation rental villas to create the perfect FOUR, FIVE, SIX, or SEVEN bedroom wedding celebration, multi family or extended family vacation, holistic retreat, vacation camp or large group function here in beautiful Sayulita, Mexico. Please view our Event Venue page. 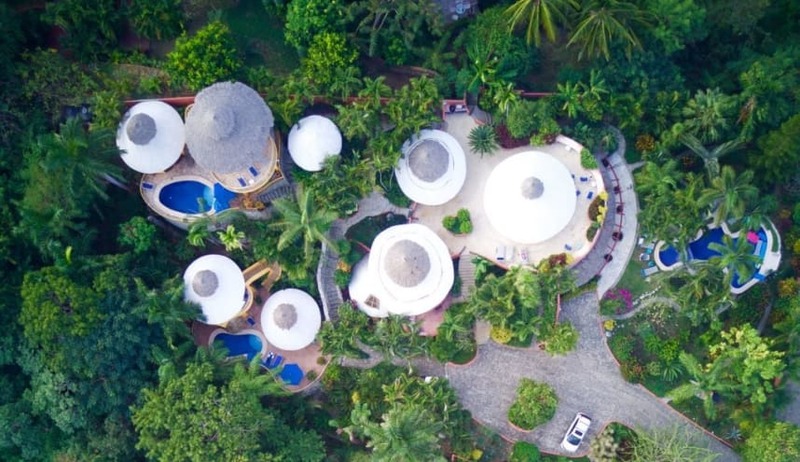 The villas are located at "Villas Rana Verde", Sayulita's premiere estate property on a beautiful gently sloped hillside with 360-degree views of the ocean and jungle, and only 75 yards from the ocean, in a tropical paradise in wonderful, sunny Sayulita! We are across the street from the ocean, just a 2 minute walk on cobblestone to the sand. The estate has almost 1.5 acres of private land, we are one of the largest pieces of estate property in Sayulita! We are in the exclusive "Pedregoso" neighborhood on the north side of Sayulita directly across the street from Casa Oso. There are 3 villas on the property, but each one is separate and private from each other. Each villa has its own private pool, gourmet kitchen, living area, gardens, etc. In fact Casa Rana Verde has 2 private ocean view pools that are connected by a cascading waterfall. The small (wading) pool is perfect for children and is right next to the adult pool. Nothing is shared between the 3 villas except for the free laundry, gated entry and cobblestone parking area. If you rent the entire estate we have accommodations with built in beds for 17 people. There is a great place for everyone to gather at the living area for Casa Rana Verde that is big enough to fit any large group. Be sure to view the slide show of the panoramic ocean views and the incredible swimming pools in our tropical garden. We live right next door to the estate to insure that your vacation will be all you expect it to be. Our driver can pick you up at the airport in an air conditioned Suburban stocked with cold drinks. Our cook makes the best Mexican food in all of Mexico! We offer any or all meals to your group. Everyone loves our cook's fabulous meals. Wireless internet is included and we have free long distance telephone calls to and from the US and Canada. We are located about 1/2 mile from the village in an area of private villas away from the all night noise of the village with its roosters, soccer field events and cantinas. Your quiet night of sleep is assured. The short 10 minute walk to town can be along the pristine, sandy beach or a low traffic paved road. This fully-furnished estate features ocean and jungle views from every room and one-plus acre of private, gated land. All rooms are furnished with the finest amenities such as Ralph Lauren towels, 400 thread count all cotton sheets, down and other comfortable pillows, Guatemalan fabrics for all curtains and pillows, furnishings that will allow you all the comforts you need while enjoying our incredible villas! Our kitchens are fully stocked with as many small appliances, frying pans, wine glasses, coffee cups, plates, bowls, utensils, etc. as you have in your own homes. Everything in the kitchens are in abundance. All the kitchenware is matching Fiestaware, matching high quality flat ware, hand loomed Guatemalan and Mexican all cotton napkins, everything the best!. Remember many villas discourage children, but we cater to kids, we have cribs (2) and (2) highchairs for your children, so no need to rent them. Our kiddie pool attaches to the main pool connected by a cascading waterfall. The kids love it, the parents love it even more! We have babysitting services available from our Mexican family of over 14 years, who are really part of our family. Our free laundry means that you can bring less children's clothing on your trip. Our driver has multiple childseats for the trip from the airport. The beach across the street is one of the most pristine, sandy, private beaches you have ever seen with the cleanest water in Sayulita. There is great surf fishing on the beach right in front of the estate. The fisherman regularly catch snook, sea bass, grouper and many other varieties. It is not unusual to be the only person on the beach for 1/4 mile in each direction. It is a nesting grounds for Leatherback turtles who can be seen in the early morning hours and late evenings during summer months laying their eggs or hiding the nests before their return to the ocean. Our lovely estate is home to the most beautiful birds that you are likely to witness outside the most complete aviary of exotic, tropical, colorful birds! We have identified over 100 varieties of these magnificent creatures. Without even leaving the estate you can view hummingbirds, orioles, tanagers, caciques, finches, parakeets, parrots, woodpeckers, chachalacas, trogons, hawks, honeycreepers, warblers, and much more. There is an even larger abundance if you venture into the nearby jungle. This is a truly unsurpassed bird-lovers delight! The best tropical garden in Sayulita is at your doorstep with private, gated grounds that feature over 20 varieties of palm trees, plumeria trees, many varieties of hibiscus and bouganvilla, sweet jasmine everywhere, birds of paradise, gardenia, corona, maguey, abundant catii, almond trees, jamaica, bananas, papayas, Mandarin oranges, Persian limes, orchid trees, and much more. If you love to garden, this is a once in a lifetime opportunity to live in the midst of nature! Meander through our many cobblestone pathways into a tropical botanical paradise seldom seen on private grounds. All 3 villas can rented together with 7 bedrooms, 10 baths, 3 kitchens and 4 pools for a great wedding or birthday celebration, extended family or multi family vacation, yoga & holistic retreat or vacation camp! We have the best home, pool, garden, location, views and amenities in Sayulita and thus can offer you one of the best Sayulita Mexico vacations available! No matter how beautiful you imagine our estate to be, when you get there it is twice as beautiful! Stayed here 6 nights as part of a group of 17. Lots of room to not be on top of each other but small enough to let the kids run. Casa Rana was a wonderful setting for our multi-family holiday gathering. The owners were kind, attentive, and accommodating. The layout worked well for our group which included three families, with young adult/teenage children. The location to town was perfect giving our mixed age group flexibility with easy access to town and the beach. We enjoyed the quieter location north of town. Additionally, the homes are close to the beach which allowed easy access for early morning surf fishing. Casa Rana's set up allowed freedom for members of our group to easily come and go as they pleased and enjoy all that Sayulita offers! It was also nice to have the availability of on-site chefs. The views from Casa Rana are absolutely stunning! This property is the most beautiful getaway in Mexico! The layout of all the villas was incredible, with traditional Mexican style design, plunge pools all over and super secluded. It was perfect for our big group. We had breakfast cooked onsite in the outdoor kitchens and the food was really really delicious, those women know how to make a great Mexican meal. Barry was amazing at helping with everything and very responsive. All in all, it was an amazing time and we really appreciate everyone involved for making it a flawless weekend. BEAUTIFUL!! Perfect for groups and large famlies!! This place is AMAZING!..Beautiful, lush, tropical property that feels like your own secluded paradise!..The casas are extremely clean and well taken care of. They are totally updated with great kitchens, soft comfy beds, ocean views, private pools for each casa, and fast WiFi. Having your own private pool in each casa is awesome! The beach is just steps away from the property and is beautiful. This part of the beach is super clean and way less crowed...If you have a group or a large family this IS the place to stay!! Villas Rana Verde was perfect for our family Christmas vacation (11 adults ranging in age from 18 to 85). The property is beautiful and well maintained. The pools, rooms and the kitchens are all clean and well appointed. We used Angel's services for transportation to and from the airport and that worked well. Lucia and her team are wonderful cooks. We ate about half our meals at the Villa. It is about a 5 minute walk to a relatively secluded part of the beach and town is an easy 15 minute walk. We also rented a golf cart that was very convenient. Barry (the owner) was a pleasure to work with and very helpful and responsive. I highly recommend Villas Rana Verde and we hope to return again soon. We loved staying at this property! We stayed in casa Mikayla and had friends in both other villas on the property and it was just perfect! Barry arranged for cooks to come and the food was sooo good with tons of left overs for the next day. Everything was clean and well maintained and if there was anything we needed, it was easy to get ahold of someone. Easy 10-15 min walk into town on the beach or the streets and it felt very safe. Would highly recommend and would definitely stay here again! Incredible Stay for our Large Group! Our stay and level of service we received as this property was top notch! We rented all three houses on the property and they were all impeccable with excellent air conditioning. The housekeepers prepared breakfast and dinner every night and not only was it excellent, but it was incredibly reasonable. There are three of four pools on the property. The owners answered all my emails within the hour and helped with all of our needs. We will be back! I've been telling all of my friends that our stay in Sayulita at Casa Rana Verde, Casa Mikayla and Casa Pajaro was a fairytale vacation. 21 of my family members stayed at this gorgeous compound and we all felt like we had our own space. The children were in Heaven on earth! The views were breathtaking, the amenities top notch, the grounds were awe inspiring (blooming with life and love). The central palapa was perfect for gathering, watching the gorgeous sunsets, playing games, feasting and just being together in the beauty of our surroundings. Lucia's food was beyond incredible and made with love and joy, fine dining in Paradise for sure! Her daughter made 2 cakes for us during our stay and they were both incredible and worth every penny and more. Lucia and Rosie replenished our casas with care everyday. Chuy was a Light and an artist in the gardens and we enjoyed seeing his smiling face everyday. I could go on and on...not only will we be back in the future but each of our lives were enriched and changed by the beauty and magic of this sacred location. We loved Sayulita but our trip would not have been as spectacular had we stayed anywhere else in town. Barry and Connie you have outdone yourselves with employing beautiful people, decorating with artist eyes, and creating an absolutely mind blowing estate to venture out from. We are forever thankful for your hospitality, your generosity and for sharing the paradise you found, cultivated and nurtured, with each us! It was my wife's 70th birthday present and it had to be special. It was more than that! She and one daughter had been to Sayulita previously but never had such a good time. 21 of us. Kids, grandkids plus a sister and her family. We had security and privacy with everyone having there own space but great areas for families and friends to be together. The maids who will also cook (for small charge) can REALLY cook. Property is very well maintained and the rooms are decorated wonderfully. I got to know a few people in town and Barry/ Connie ( owners who live next door) have a great reputation with the locals as complete and tasteful landlords. (Plus they own a shop in town with some nice items. I can't get over how clean and well equipped all 3 casa's were. I will be back! P.S. Barry will become a friend who will help with stuff when asked. Contact us via the form either by email or telephone and we look forward to welcoming you to Villas Rana Verde. Reservations: All rentals are subject to a $250 refundable security deposit. This deposit will be refunded in full 2 weeks after departure less any damages to the property. All reservations require a deposit of 50% of the total rent due plus the security deposit to guarantee reservation. Balance due 60 days prior to arrival. Cancellation policy: 60 day notice required for any cancellation for full refund less $250 service charge for each villa canceled. 90 day notice required for all Holiday weeks (Christmas, New Years, Thanksgiving, Easter, President's). Any cancellation after notice date will be refunded (less service charge) only if owner can rent property at equal value for dates canceled. If owner has to rent the property at a lesser rate, the difference between the original rate and the rate the property was re rented at plus the service charge will be deducted from the refund.